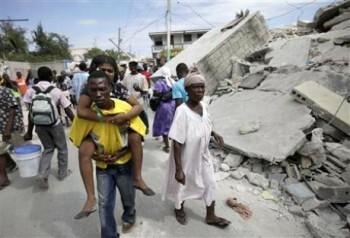 This Reuters photo shows the devastation in Haiti's capital of Port-au-Prince. Want to know how you can aid the relief efforts in Haiti? Haverford has been hearing from Fords with ideas about where you can direct support to help the victims of the massive earthquake. Also, links to Philadelphia Inquirer stories about Haverford brothers separated by the disaster (and now safely reunited at the College). Emily Davis '99, senior director of financial development with the American Red Cross, Southeastern Pennsylvania Chapter, says,“The American Red Cross, in partnership with Red Cross Haiti and the International Federation of Red Cross and Red Crescent Societies, is already on the ground in Haiti.” The groups are providing immediate relief in the form of food, clothing, shelter and medical services. The American Red Cross is currently deploying a Relief Emergency Response Unit team. The International Federation of Red Cross and Red Crescent Societies, as well as UN agencies and the U.S. Agency for International Development (USAID) are deploying teams to coordinate humanitarian assistance and provide search and rescue services. This organization, profiled in the latest Haverford Magazine, is an online giving platform that makes it easy to support any charity, anywhere online. Network for Good, whose CEO Bill Strathmann, COO Katya Andresen and Sales Associate Benesha Bobo all graduated from Haverford, has processed over $5 million in Haiti relief donations to date and rushed an expedited payment to several charities so they can start using the funds right away for critical aid. Tom Yarmon '69 says he will be donating to this organization, which is responding to the devastation by raising funds for a solar water purification system (to try to help prevent water-borne disease outbreaks such as typhoid) and a mobile renewable power station that can serve as a medical post. Personally, I am sending donations to Catholic Relief Services, my former employer, and to AFSC. I am particularly keen on CRS because I know that they and their local and global (Caritas Internationalis) partner organizations already have a strong presence in Haiti. CRS also has agency-wide emergency response expertise/staff that is/are being put into action immediately. The current CRS Country Representative (Karel Zelenka) and his predecessor (Bill Canny) are both very capable and experienced (both are also good friends of mine going back to the mid-80s). By some stroke of genius or luck or providence, Bill had been appointed as head of the CRS agency-wide emergency team when he was transferred out of Haiti to Baltimore headquarters only two months ago. See www.crs.org for more details about CRS' Haiti response. There are of course many other very strong and experienced agencies working in Haiti. Members of the Haverford community may have their own preferences or reasons for supporting any number of them. MSF (Doctors without Borders), Mercy Corps, CARE, Save the Children, and Oxfam are some of the many organizations I have cooperated/coordinated with through the years and come to respect/trust. This is probably already well-understood by the Haverford community, but I just wanted to be clear about another important aspect of the Haiti emergency response. One should, in my view, support only those agencies that adhere to international humanitarian standards such as those articulated in the Humanitarian Charter and Minimum Standards in Disaster Response (the so-called SPHERE project standards -- see www.sphereproject.org). The organizations I mentioned above all subscribe to international humanitarian standards. Among other things, that means that they provide relief assistance to those in need without any strings attached (i.e. they do not proselytize or demand any quid pro quo such as religious conversion in return for assistance), and they do not discriminate on the basis of religion/creed, ethnicity/race, nationality, etc. My experience tells me that what is needed now is cash donations. NGOs (at least of the CRS type), UN and governmental agencies will be focusing for the foreseeable future on sending in highly-qualified and experienced emergency staff. To try and send anyone else at this point risks taking up very limited, valuable space on planes and boats that are needed for both relief supplies and trained personnel. Cash donations allow organizations to focus on their strengths and to apply/adapt them to the local circumstances and needs. Elizabeth Dowling '91, who is in the process of adopting a little girl from Haiti, says that Kentucky Adoption Services, which supports children in three orphanages in Port au Prince, is in need of help.“In the aftermath of the earthquake, the orphanages expect to have many more orphans with little additional space or resources to support them,” says Dowling.“Kentucky Adoption Services is working to get medical supplies, food and water to the orphans of Haiti and working to attempt to get emergency visas for those orphans already in process with American families. This will provide much needed space for those children that have been orphaned by the earthquake." For more information, go to www.kentuckyadoptionservices.org. UNICEF's response, coordinated with other UN agencies and the International Red Cross and Red Crescent is aimed at the children and women, who are the most vulnerable in times of crisis. Children under 18 make up nearly 50 per cent of the 10 million population of Haiti. In the town of Jacmel this evening 2,500 kitchen kits and 5,000 1 litre bags of water will be distributed to enable the local population to prepare the food supplies by the World Food Programme. A cargo plane will land tomorrow containing $500,000 of supplies to assist 10,000 people, including oral rehydration salts to combat deadly diarrhea episodes, water purifications tablets, tarpaulins and tents to provide temporary housing. UNICEF has released a total of $3.4 million toward the relief efforts from several emergency sources. The agency says that more funding, basic medical and health supplies, family kits/shelter and water hygiene and sanitation supplies are urgently needed. I've been trolling the internet about the earthquake disaster in Haiti, and trying to learn more about how to support Haitian-led organizations which will need help in the coming days, months and years to heal, rebuild and advocate for more just policies within Haiti and between Haiti and the U.S. I thought I would share some of what I've been finding. I don't claim any expertise on Haiti. But part of why I believe in supporting small organizations there is because I've worked for small community-based organizations in Philadelphia for almost ten years, and it's been the best way for me to work at making lasting, positive change. Here are a couple of the organizations and charities that people and sources I respect are putting forward as organizations with reputations for doing good work there. I think they might be more able than the Red Cross to put your money to direct and long-term work, and they're not getting as much publicity as the big organizations. Established by a group of folks who have been doing Haiti solidarity work since 1991, working closely with Haitians to build and support mass-based civic groups on the ground there-- unions, peasant cooperatives, schools, women's organizations and more. Bernice Kegel, mother of Terry Kegel '03, is on the board of the Prosethetics Outreach Foundation. She says, "If anyone is interested in donating specifically to help amputees in Haiti, our organization is accepting those donations, which can be made online."